A directory of Amish furniture in New Hampshire Amish can’t be found in New Hampshire, but their furniture can. A number of Granite State Amish furniture dealers provide access to Amish-made tables, chairs, desks, beds, cabinets, outdoor furniture, and much more. Residents of Manchester, Nashua, Concord, Dover, Derry Village, Rochester, and other New Hampshire cities have Amish furniture suppliers within easy reach. Two New Hampshire Amish furniture locations. Furniture made by Ohio and Pennsylvania Amish, including Shaker style pieces in antique/distressed finish. Amish furniture for the living room, office, kitchen, dining room, bedroom, and more. Amish-made beds, dressers, night stands, TV tables, entertainment centers, cabinets, sofa tables, rocking chairs, book cases, desks, filing cabinets, hutches, sideboards, and more. Also carries poly outdoor furniture, rugs, linens, candles, lamps, table cloths, and other accessories. Amish gazebos, sheds, gliders, benches, picnic tables, porch swings, and other Amish-made outdoor furniture. Carries some Amish furniture among a number of American furniture suppliers. To locate Amish furniture in states other than New Hampshire, try the Amish Furniture national listings, with a full directory of Amish furniture dealers in the US and Canada. Note to New Hampshire residents: Please be sure to check opening hours of any Amish furniture businesses listed in this guide before traveling long distances. While we strive to keep this directory up-to-date, business locations and schedules can change. Not responsible for changes to information. New England has seen little Amish settlement. Though Amish have a long history of migration, and in recent years have settled in many new places, New Hampshire Amish communities have still not appeared on the map. The nearest Amish to New Hampshire can be found in Maine, with a small number of Amish residents, as well as New York, which has seen one of the fastest-growing Amish populations of any state in the nation. Despite their absence in the Granite State, thanks to a number of non-Amish dealers, Amish furniture is available to New Hampshire residents in-state. Amish furniture has risen in popularity in New Hampshire in recent years, and for that matter, across the nation, as it has become better-known and consumer demand has grown. Amish furniture has gone beyond a niche position to occupy a significant segment of the US furniture market. One factor feeding this growth is the positive reputation enjoyed by Amish woodworking. Buyers of Amish furniture appreciate the high level of quality typical of Amish-crafted pieces. Amish woodworkers pay careful attention to detail, and use high-quality materials. Amish furniture is typically made with solid hardwoods. Popular woods include maple, walnut, hickory, oak, quarter-sawn oak, cedar, black walnut, poplar, ash, and more. Amish in certain areas have developed a unified assortment of stains to assure consistency and enable buyers to match pieces by stain color. The versatility of Amish craftsmen is another factor feeding the growth of the Amish furniture market. While you might assume Amish create only the plainest styles, Amish woodworkers in fact produce a wide range of furniture designs, as well as innovating new products. Popular Amish furniture styles include Mission, Shaker, Colonial, Craftsman, Arts and Crafts, Queen Anne, along with contemporary styles. Amish furniture craftsmen also frequently do custom work made-to-order to the client’s specifications. For example, custom kitchen work is common, with Amish cabinets custom-made to fit the customer’s home proving ever-popular. Amish also create furniture for the rest of the house, including the living room, dining room, family room, bedroom, office, and children’s room. If you’re looking for an Amish furniture dealer in New Hampshire, you have a number of options. Listed above are a number of in-state sellers of Amish furniture. Amish furniture businesses often have showrooms where customers can visit and peruse the many items on offer. Alternatively, Amish furniture shoppers can order online from a dealer shipping Amish furniture direct to New Hampshire, of which there are many. New Hampshire residents might also consider taking a trip to an Amish settlement out-of-state, with a Maine Amish settlement (Unity) a 3-4 hour drive from Manchester, and settlements in New York at a similar distance (Mohawk Valley). 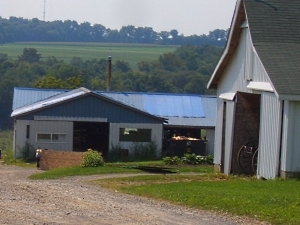 Visit the Amish America State Guide for more info on these communities.